SURKHET, March 9: Eight years ago, 72 years old Kalu Giri moved to Beureni of Pokharidanda after being displaced from Simali of Lagaam. He has a single-storey wooden house built in four Katthas of land provided by the then seven political parties. He has been sharing this house with 17 other members of his family. Four of his sons have gone to Kalapahad (India) for employment. The money earned by his sons is spent on buying two time meals for the 14 members. "We do have a shelter but have got nothing to eat," said Giri, adding, "We could have started a business if the land that we live on was ours." 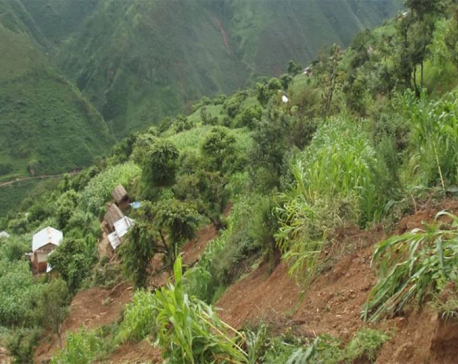 The devastating landslide of 2010 had displaced 140 households of Simali, Lagaam. After a political agreement, those victims were kept in the community forests of five out of 12 VDCs of the west. Lal Bahadur Gurung was one of the victims of the deadly landslide. Political parties rehabilitated his 12-member family in a community forest near Bidhyapur Bazar. Bidhyapur is a comparatively developed place than Lagaam but Gurung has not been able to experience that. "We are often threatened by the forest guards and officials," laments Gurung, adding," It would be a great relief if we owned this land." Living miles away from their loved ones and relatives is hard in itself and the fear of being displaced again adds to their plight. The government has formed three commissions for addressing the issues of the squatters since 2010. The officials of each commission reached the doorsteps of the victims to hear their grievance. But nothing has happened. "If we had our own land and house we could return but unfortunately we don't," said Khagisara Gurung of Dhadibas. Lack of ownership of land has deprived these locals of various government services and privileges. "We do not have access to electricity, water and various other amenities which have been assured in the constitution," laments Gurung. The government has recently formed District Settlement Management Committee (DSMC). This committee will identify the people living in various slums as squatters or displaced. It also has the right to provide the victims written documents which will allow them to use the services offered by the government. "Community forest, local units and District Forest Office often stick notices urging us to leave the land," said Gurung, adding, "It would have been easier if we were just provided with the written proof." In order to identify such settlements, the committee has started discussions in all nine local units of the district. "We will soon identify such people and provide them documents that will allow them to use various services but it will also have its limitations," said Ram Bahadur Singh, chairperson of the committee.